Even the very best audio equipment in the world is going to sound like trash if you put it in a room with bad acoustics. That’s why it’s important that your listening room receives the right sort of acoustic treatment (to learn more about acoustic treatment in general, check out my informational article on the subject first. While it’s entirely possible to make a room acoustically suitable for listening without using any sort of special equipment, sometimes it’s just more practical and straightforward to throw some money at the problem and get specialized panels to absorb or diffuse unruly sound. So, here I have collected a few products that you can order online which should help make your listening experience go from good to transcendental. Ironically, for equipment meant to improve sound, I think that how acoustic paneling looks is just as important. One of the main reasons I personally avoid using this method of acoustic treatment is that it can completely ruin the look of your room. I don’t want to spend time in a place that looks like a pro studio, no matter how good the sound is. Your listening room is meant to be a refuge and a place to relax. That being said, you can integrate these different paneling solutions in such a way that they make your room look nicer. A lot of modern panels can actually be mistaken for purely decorative objects, so I’m especially critical of this aspect of paneling. I’ve listed my top picks first, but the rest of the reviews are not in any particular order. 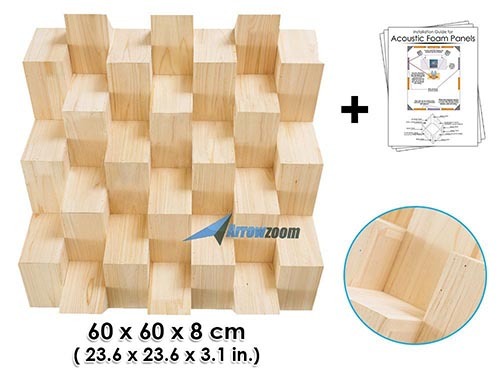 I immediately got excited by these SoundTrax Pro foam panels, because they’re obviously something different from all the egg-carton pyramid foam products out there. These two-inch thick panels have an awesome and unique pattern which I really like. In particular, they look good as individual groups of panels, which is how you’d want to use them. Personally I’ve always thought that pyramid foam panels only look sort of good when you do them wall-to-wall. Looking at all the pictures of how different people have styled and used these, I’m pretty much sold on them from an aesthetic point of view. This is a 12-pack, which is sold as 6 nested pairs. The pattern they’ve come up with is meant to be full of little peaks and valleys, letting the panels do more sound dampening work than the two-inch thickness would lead you to believe is possible. The downside is that if you actually wanted to do wall-to-wall paneling using this foam you really aren’t going to get a seamless join. The way they explain it, what you get in the box is cut from one huge panel that will all fit together like a jigsaw puzzle or let you space it all out as you please. Which means that you’ll never find a piece from another box set that exactly matches the ones you have. This cuts down on cost, but has this logical outcome. So was all the effort to make squiggly foam worth it? It seems the answer is an overwhelming “Yes!”. Everyone from music fans to voice artists are very positive about this foam. It’s a fair price, the looks are fantastic, and the endorsements of its audio properties seem on the level. I think we’ve found our mainstream winner. Although these pads are not meant to treat the acoustics of your listening room, they are meant to acoustically treat your speakers themselves. Go check out my reviews of monitor speakers to find some awesome examples. By placing your monitors on these you can prevent resonance between the room and the speaker cabinets. It may seem weird, but just putting your monitors on these pads will make them sound more clear. Do they work? Feedback from buyers say they do. 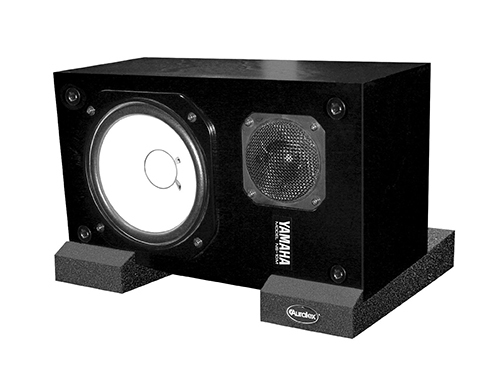 People report an immediate difference and the best part is that it doesn’t matter if your speakers are cheap or expensive, they can benefit from these isolation pads. If you are going to get any of the things I look at on this page, get a set of these. 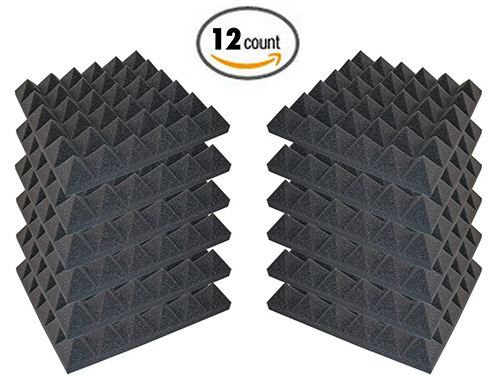 For the audiophile on a budget there’s always good old pyramid foam. This is basically the real-deal sound paneling that garage bands with egg-cartons stuck to the wall are trying to achieve. You get real value for money out of these panels, since you get twelve 12”x12” squares to place on your primary reflecting surfaces. These are designed to lessen reverb, not completely eliminate it. If you’ve ever seen the paneling they use in anechoic (reverb free) sound chambers, you’ll notice that the pyramids are much taller than these. In terms of looks, they’re professional but unremarkable. It is nice that they come in a number of muted colors, which gives you a little leeway in decorating choices. The burgundy option in particular, seems like it would work well in listening rooms that are deliberately styled for vintage audio enjoyment. 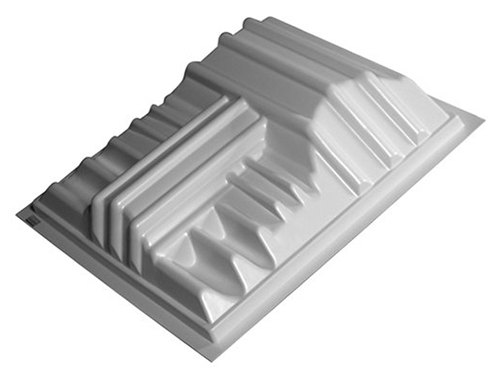 Here’s the problem – pyramid foam like this doesn’t do all that much, even though it looks the part. One of the main issues is that even high-density foam is not going to do much at only two inches thick. However, that’s not a total condemnation of these. Since we aren’t trying to soundproof a room, but just cut down on the worst of reverb, these may do just enough. If you can afford something better, than that’s what you should go for. However, at the price these are being sold at you may as well try them first and see if they help enough. Really, my main issue is that it’s hard to stick these in a room in a way that’s subtle, but I’m sure with a bit of imagination (or putting a thin wall hanging or drape in front of it) you could make it work. Here we have another 12-pack of 12”x12” foam just like the Foamily kit above. Unlike those panels, these do not use the pyramid design, but instead use the wedge-shaped method. You’ll also notice that this paneling is half the thickness of the Foamily, which on the surface does not bode well. 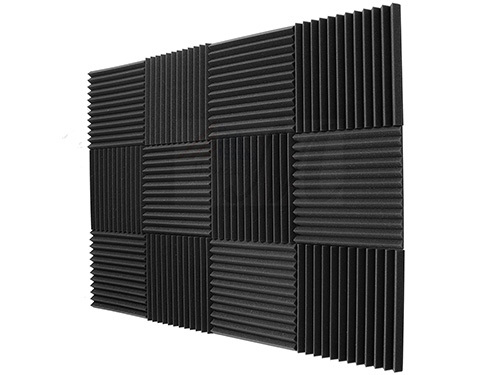 Still, this is the best-selling acoustic wall paneling you can buy online today and surely there must be a reason for it. 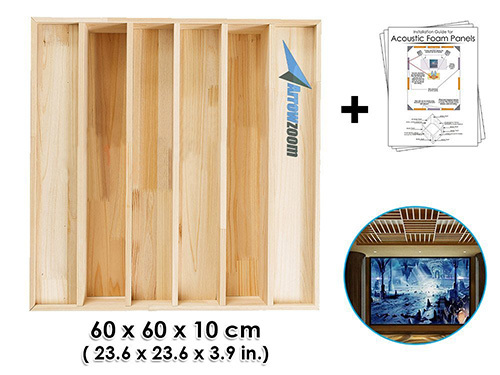 These are rated to provide 70-80% echo deadening, which sounds perfect for what we would want to achieve in a listening room, since in a personal listening room we don’t want to kill all of the reverb or the music will sound dead too. This has been specifically designed not just for professional contexts but explicitly for home theater and gaming rooms. That makes it perfect on paper, but does it perform in real life? Unfortunately, it turns out that at one inch in thickness these panels are just too thin. They don’t seem to be worth the money. Once again, your results may vary depending on how sever the echo in your room is, but in general I suspect these are going to be inadequate, so skip them. 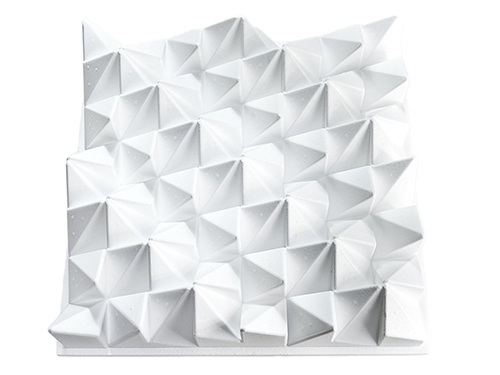 These diffuser panels from Auralex are no joke. At nearly five hundred dollars for a pack of four you need to be serious about cutting down on that echo or have a desire for perfection that has no regard for the health of your wallet. The actual diffuser has an interesting and modern shape. I really think they could be blended beautifully into a modern home theater or listening room. I also like that they are paintable, so you can either paint them to highlight them or camouflage them instead. You can’t really paint foam. You can put them up with pins, staples, Velcro, or any other permanent or temporary fastening. There is no need to remodel anything if you don’t want to. These panels are made from thermoplastic, so they should be quite sturdy while also being light. 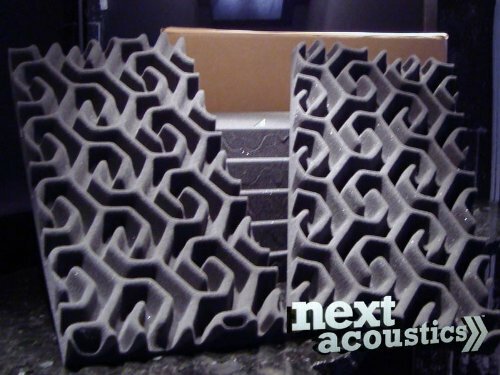 Unlike absorption foam, a diffuser like this helps to quell reverb by taking the main sound and breaking it into lots of smaller reflections that are too weak to bounce much more. So, you get what you pay for. These things work pretty darn well based on what people have had to say. They’ve even been used in some unconventional settings to help ease the noise from things like running motors and pumps, so you know they can put up with some harsh volume levels. If you can stomach the price, these diffusers are well worth the money. I find the idea behind these wooden diffusers to be very interesting indeed. For your money you only get a single panel (and you’ll need a few), but thanks to the beautiful naked wood finish this can basically go into any room. There’s also no reason not to stain them a different color. In the promo photography there’s a picture of an entire ceiling covered in interlocking panels. I think it just looks gorgeous despite its costing a fortune to do it. Most people are not going to use this wall-to-wall however. Instead, the idea is to take four or five of these and alternate them with foam panels. So the question is, does this work? There’s no reason it shouldn’t, but this doesn’t have those intricate patterns that other modern diffusers have. It’s basically just a nice little piece of wooden shelving with sound traps in its shape. The sound goes in and then breaks up inside. When I wrote this I couldn’t find anything from people who’d actually bought this to determine how effective the diffusion is, but I can’t think of a reason this design won’t do a good job. On the upside, the maker promises a 100% money-back guarantee, so I guess we can take a chance on them. Sometimes a simple finishing touch can make all of the difference to the look of your room. 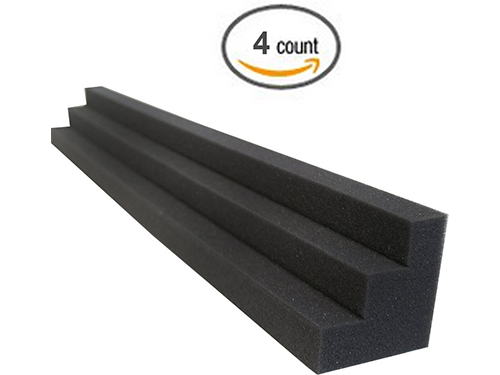 These corner wedges are not strictly needed for most acoustic treatments of listening rooms, but if you want to get that last bit of sound reflecting into the corners, this is the way to do it. This is a 4-pack, which means it is as cheap as chips, but you can also buy them in sets of eight and twelve. They are very small and quite a few people can’t hear a difference, but if you have a few corners in the room where you know sound is piling up and reflecting, this can be a cheap and easy way to deal with the problem. These diffuser panels have the wildest design that I have ever seen. They look like a 90s digital acid trip or shark skin seen through a microscope. In fact, while I think this is a beautiful object, it’s a bit too extreme for my taste. This diffuser, like most, is raw and unpainted. Usually I would say to paint the whole thing one color, but this is just asking for something a little more inspired. You could have alternating colors for each facet, for example. It comes with self-adhesive mounts in the box, which is a great convenience. The whole dispersal pattern is the result of extensive computer modeling. However, at double the price of my top diffuser pick, I think these are overkill for the home listener. I like panels with a wood finish and I think wood is a wonderfully natural audio absorber too. The patterning of these angled wood pyramids is just so pretty. It also opens up all sorts of painting options to make them fit in perfectly with your listening environment. I almost don’t care how effective these are, but at a mind-numbing, wallet-murdering $500 PER PANEL I’m less enthusiastic.